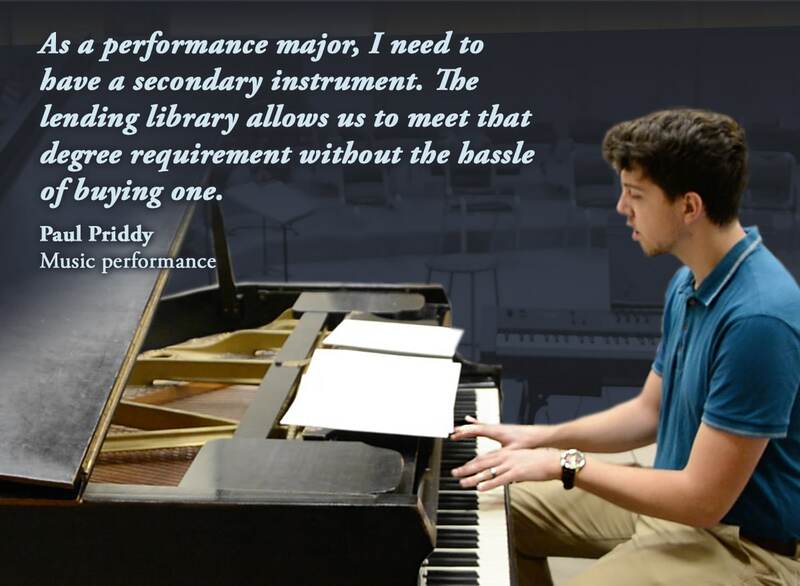 The average Washburn music student cannot afford the array of instruments needed to make their education complete. The music department meets this need with the instrument lending library – a free program that lets students check out instruments each semester. To replace aging instruments and meet increasing demands, the music department invites you to “adopt an instrument” and help raise money to grow the Instrument Lending Library. Playing in both large and small ensembles is required of all music majors. Instrumentalists majoring in music education learn techniques for multiple instruments, and vocal music education majors learn at least one instrument. Purchasing instruments to meet degree requirements would add thousands of dollars to the cost of attending college. Nearly every Washburn music student borrows instruments – free of charge – from the lending library each semester for use in the classroom, for rehearsals, and in performances such as the Vespers Holiday Concert, the President’s Concert or the Mosaic Concert. 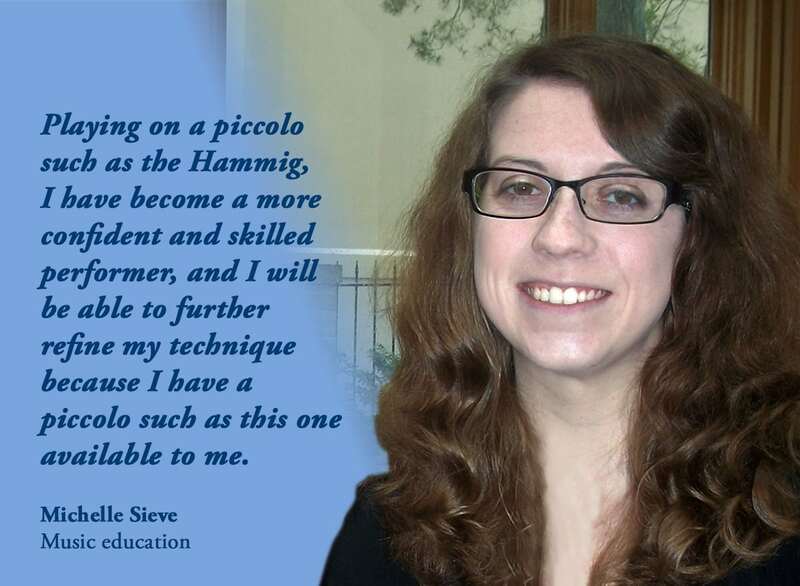 Sophomore Michelle Sieve used the University’s Hammig piccolo in the wind ensemble, symphony orchestra, chamber orchestra and piccolo class. You can help us raise $10,000 or more to purchase new instruments to replenish and replace aging instruments in the lending library. You will help the music department develop talented musicians who put on a yearly series of performances that enriches the community. Your support will also help the Topeka community, as the department always starts with local suppliers when getting price quotes. Musical instruments are expensive, but any size gift will increase the funds the Music Department has available for its library. Prices vary greatly depending on the quality and type of instrument. The Music Department can purchase student-quality stringed instruments such as violins for $500 and violas for $650. Brass instruments can range from trumpets and trombones for $3000 to tubas for $10,000. Woodwinds range from flutes for $1,300-$5,000, piccolos from $4,300, oboes from $3,000-$7,000 and saxophones from $4,000 all the way to $23,900. 20 gifts of $25 provides $500 and allows us to purchase a violin.